Stores the most frequently read disk data in RAM. Applications that frequently read large amounts of data from the disk will receive much of their data from RAM rather than disk, thus greatly increasing their performance. Also supports writing disk data immediately to RAM and later to the disk (deferred-write, or lazywrite mode), accelerating applications that frequently write large amounts of data to the disk. 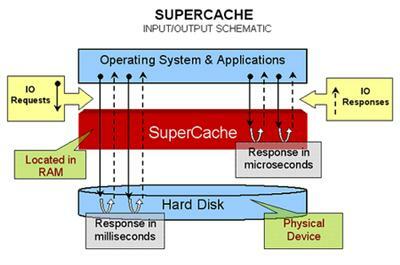 SuperCache, a block- level cache, complements the higher-level Windows NT file-system cache. Maintains all disk data in RAM. Also allows for writing disk data immediately to RAM and later to disk (deferred-write, or lazywrite mode). All reads to and writes from the disk actually occur in RAM, at the fastest transfer speeds possible. However, all data is maintained both on the hard drive as well as in RAM (like a mirror), so it is safely retained between boots. SuperCache breaks the disk I/O bottleneck by using the computer's RAM to hold or contain the most frequently used disk data. This 'container' is referred to as a cache. With SuperCache, as a program sends and receives disk data, the most frequently used data is read from and written to RAM - not the hard drive - thus accelerating the program's performance. SuperCache implements our patented block-level cache technology to increase performance above that of the operating system's file-level cache.